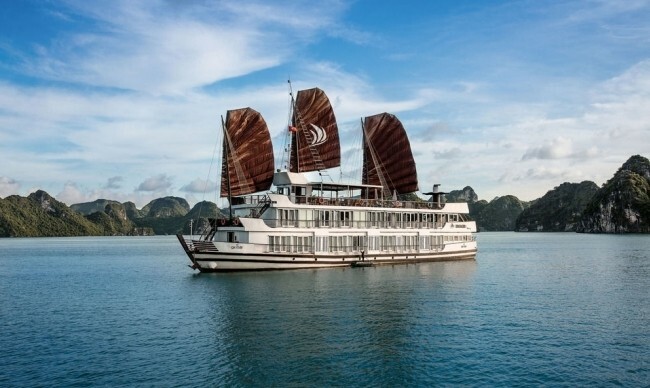 We booked a 2 day trip on Pelican Cruise with Happy Travel and we were extremely happy with the cruise. 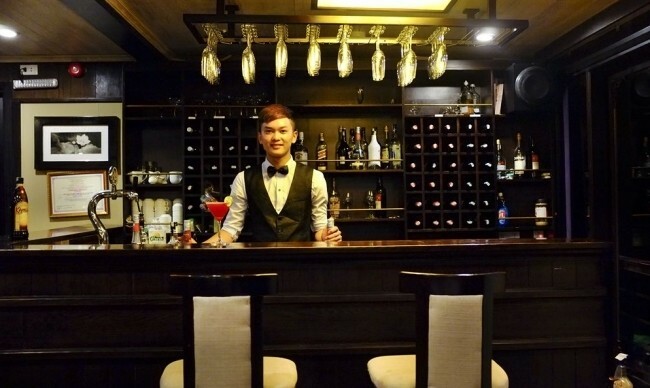 Thank you for your good service. 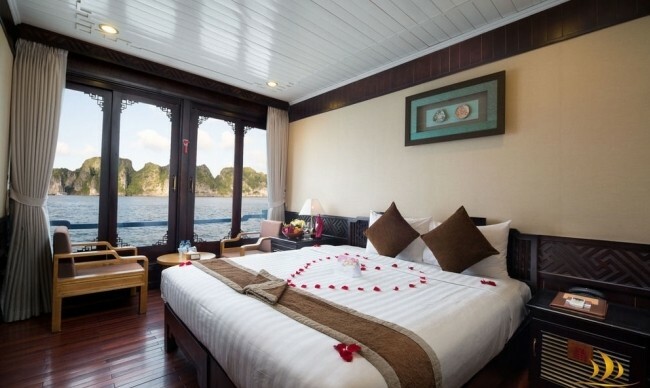 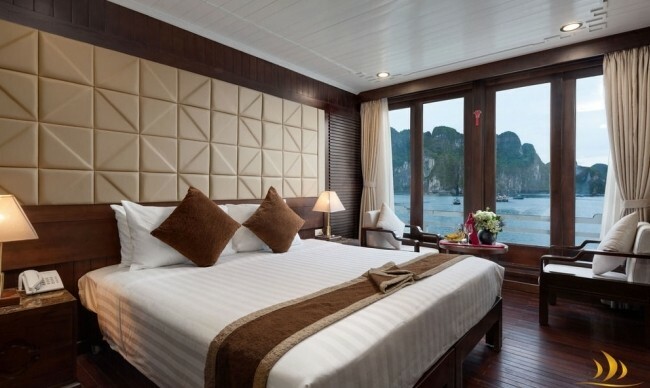 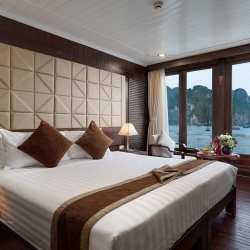 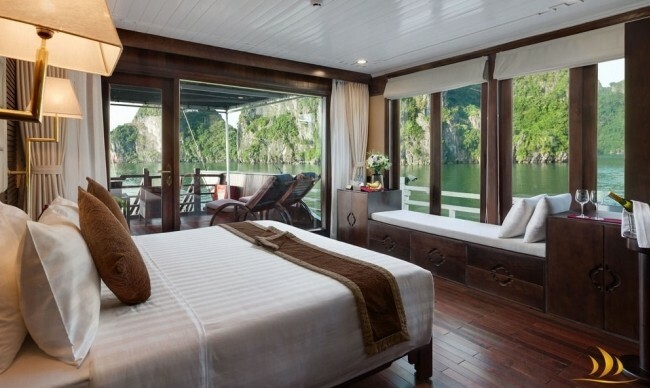 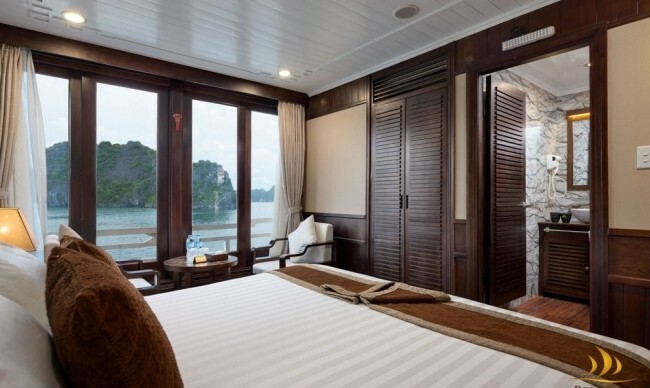 All cabins are especially designed with big windows open to the sea so that you can view the whole admirable scene of Halong Bay, even from your bedrooms. 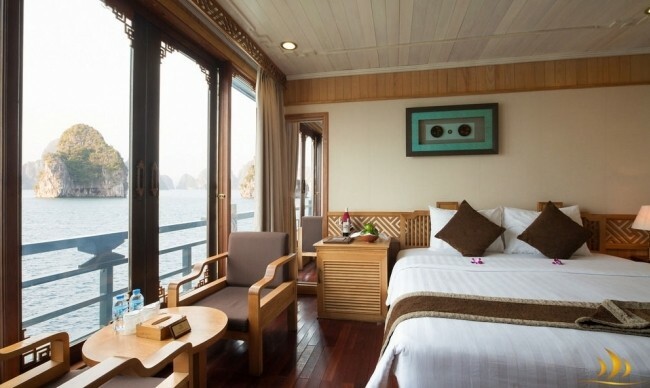 Located on the second floor with different styles and panorama windows open to the sea so that you can view and feel the real wonderful Halong Bay. 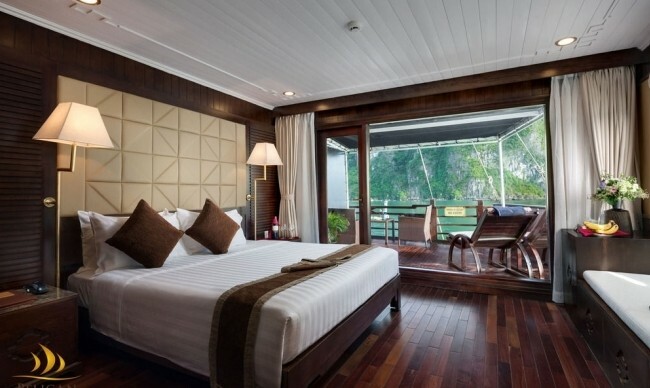 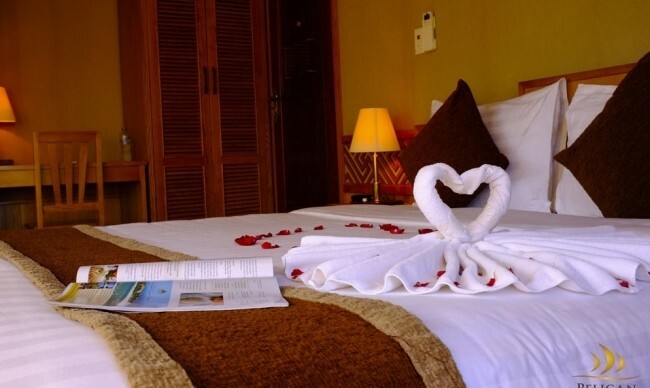 Royal Suite Ocean View Cabins with private gracious balcony allow streams of light into an airy 3 sqm room featuring elegant furnishings and rich decoration. 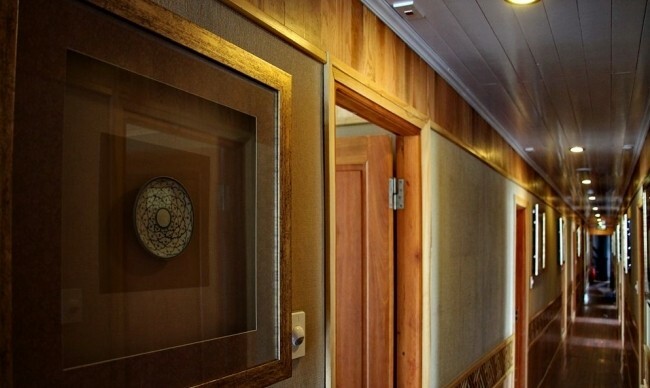 The cabins were deliberated on a combination of traditional and luxury, with a fun atmosphere to make you feel as in your home. 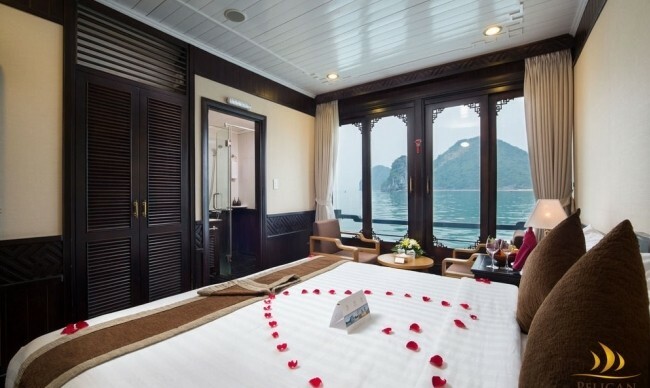 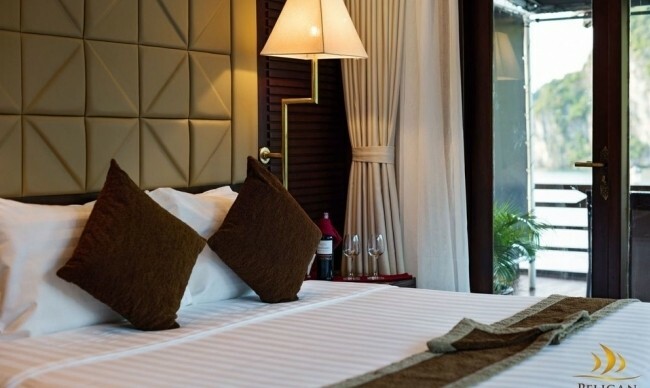 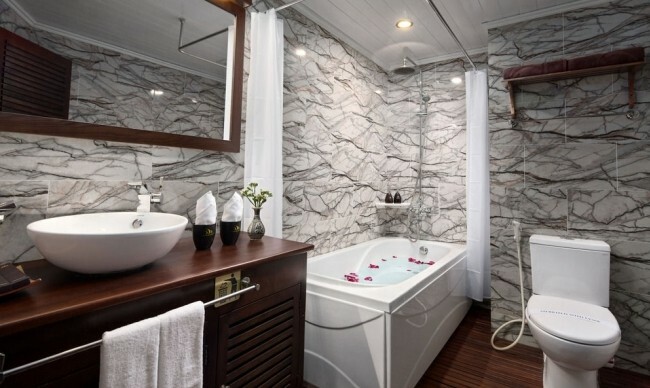 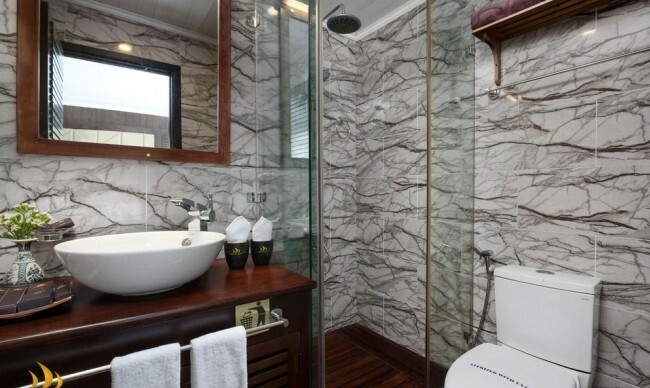 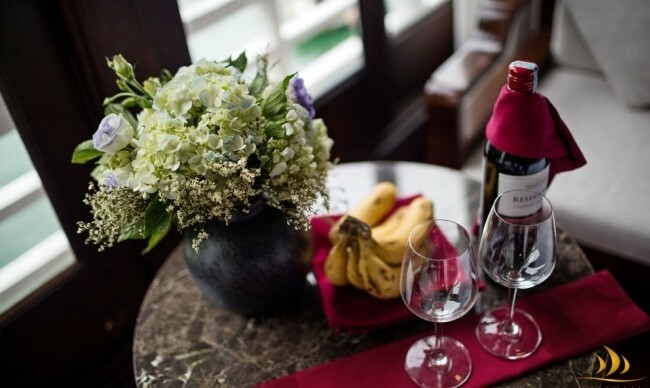 Located on the first floor with connecting rooms and panorama windows overlooked the sea, you can see and feel the real wonderful Halong Bay. 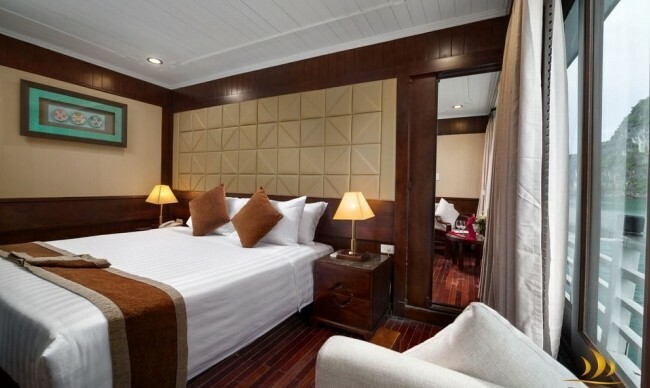 This cabin is good choice for small group or family with children. 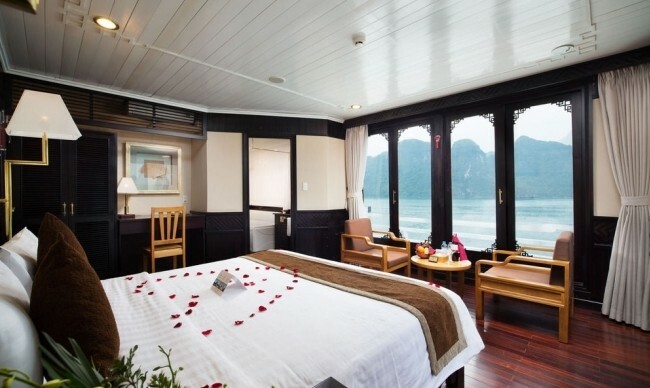 Located on the seconf floor with connecting rooms and panorama windows overlooked the sea, you can see and feel the real wonderful Halong Bay. 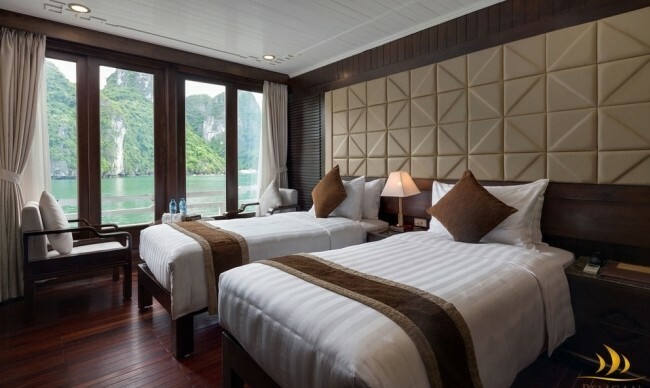 This cabin is good choice for small group or family with children. 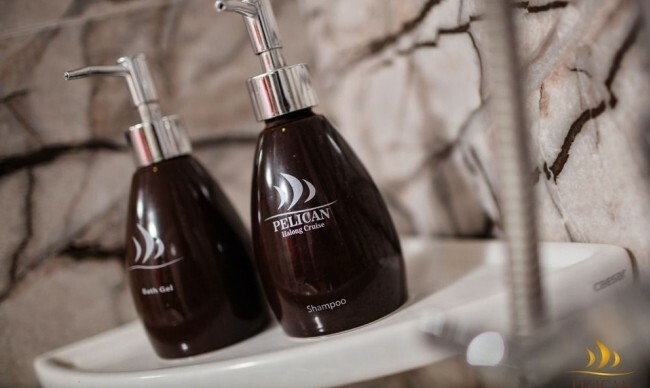 Pelican Cruise is a 4-star cruise which has come into operation since early 2012. 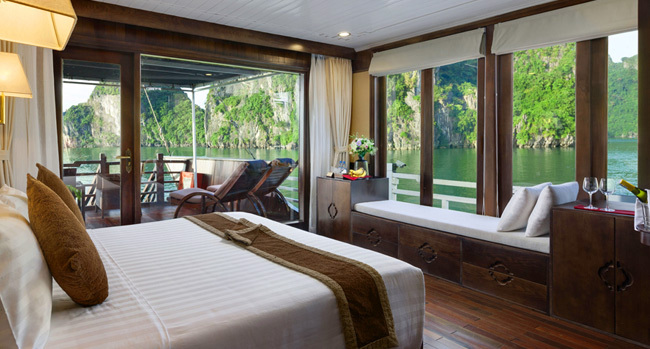 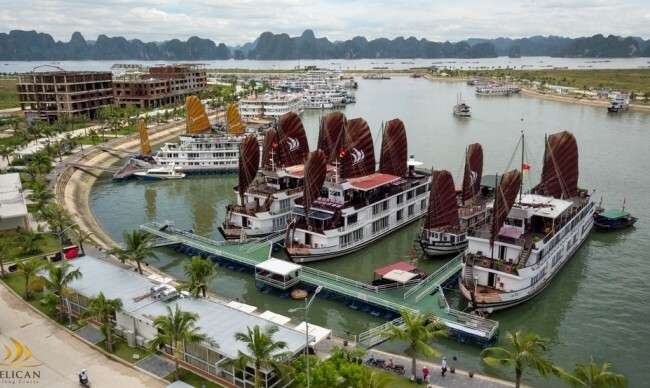 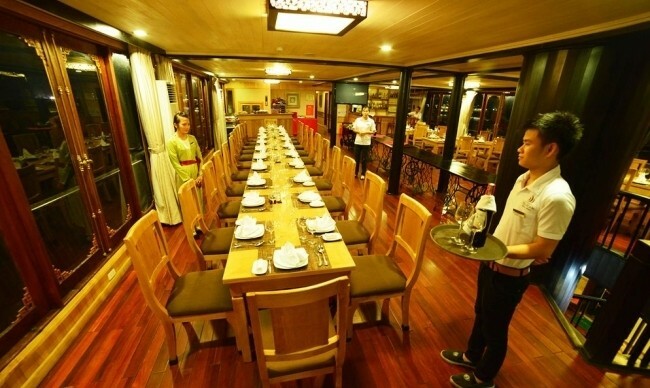 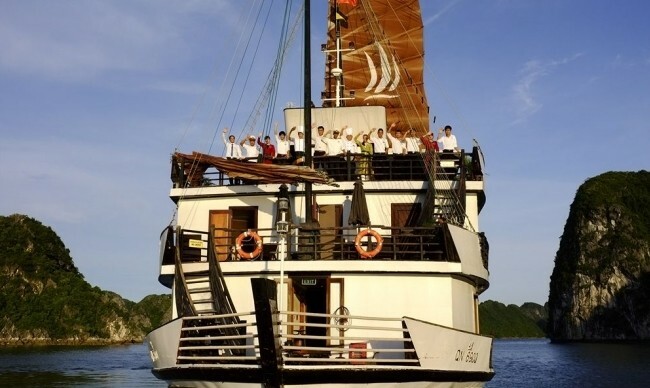 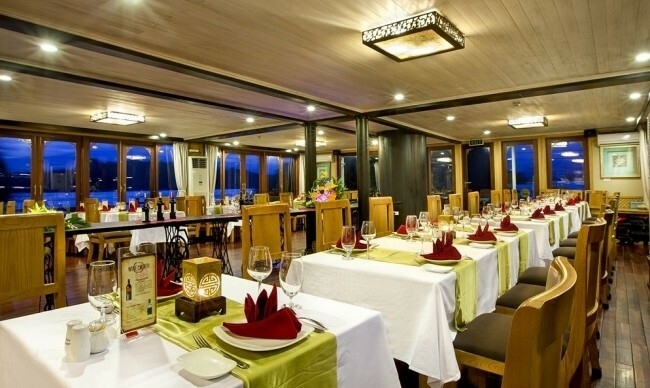 In order to bring tourists a wonderful trip on Halong Bay, Pelican Cruise offers 22 deluxe cabins of double and twin categories, restaurant, stunning sundeck as well as a beauty spa. 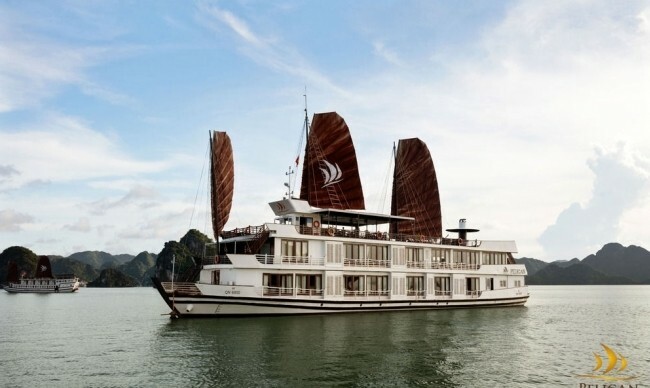 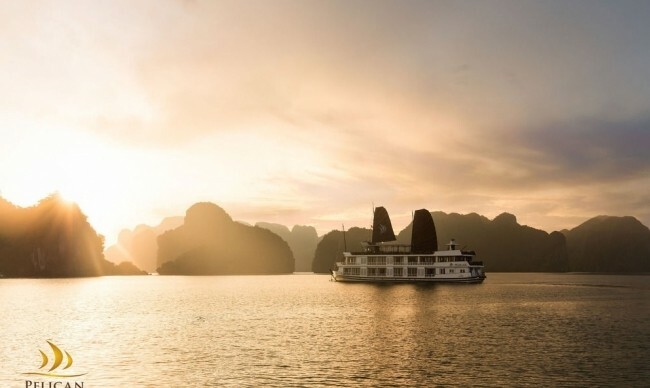 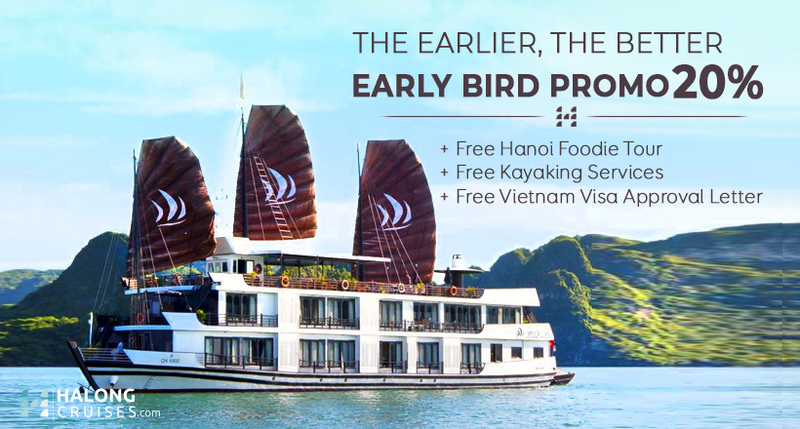 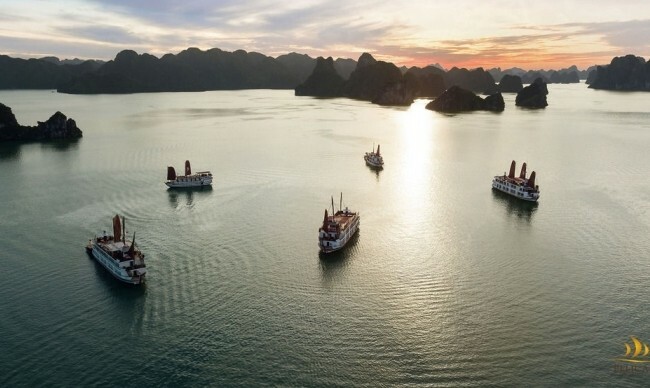 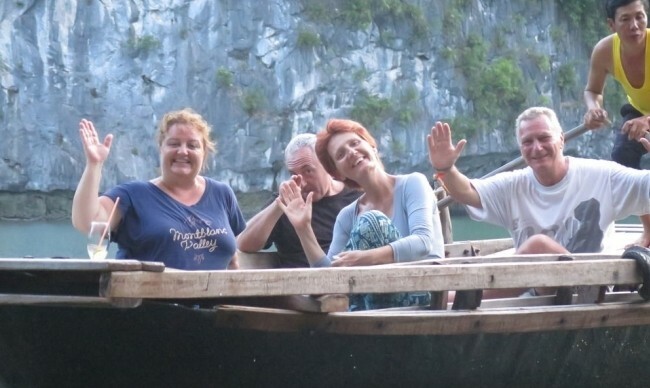 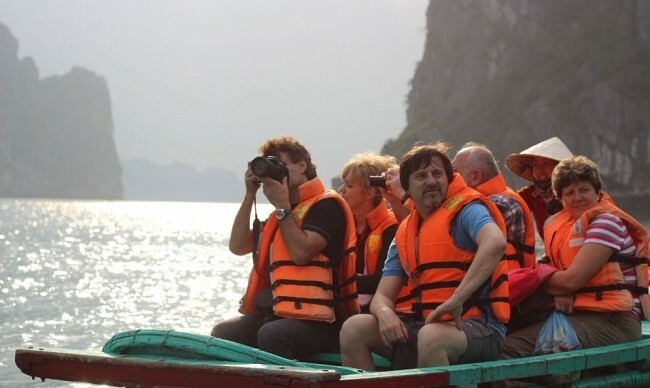 On Pelican Cruise, tourists will enjoy a warm and comfortable ambiance as well as have a great chance to deeply explore World’s Wonder of Nature – Halong Bay. 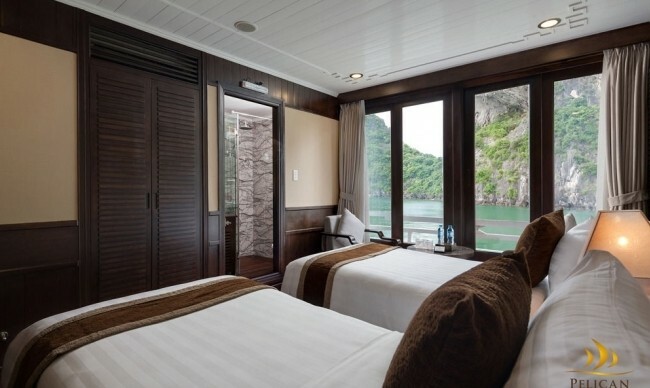 It is a modern metal cruise providing 22 cabins, ranging from 16m2 to wider suites with all necessities. 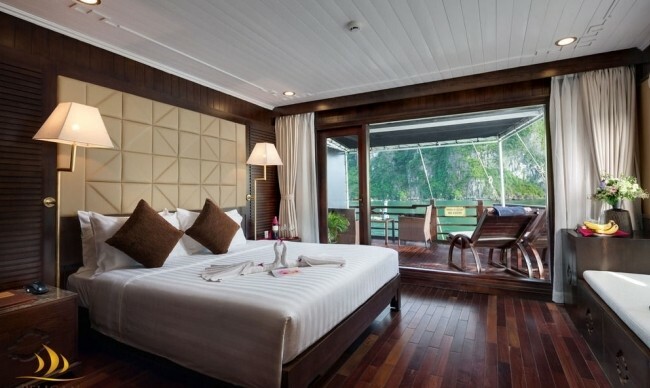 The rooms are spacious and the doors open to allow for breezes and amazing views. 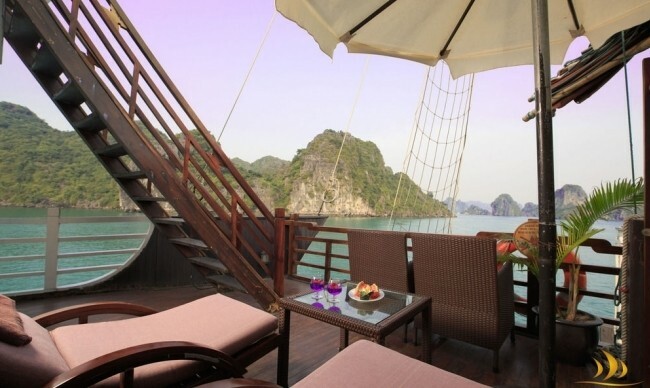 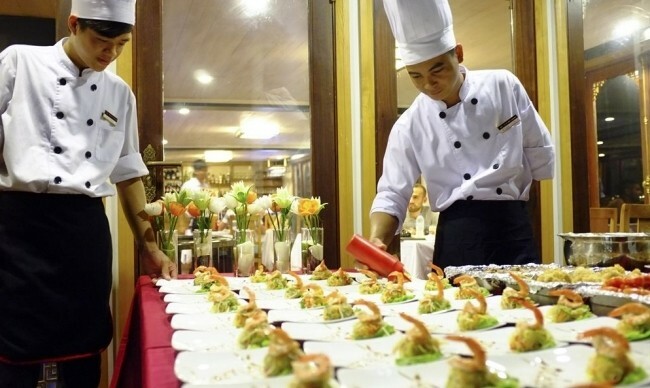 The restaurant is opened to serve you set menu from breakfast to lunch and dinner, in a mix of Western and Vietnamese fine cooking, while the wide upper sundeck allows you to contemplate sunset while sipping an aperitif. 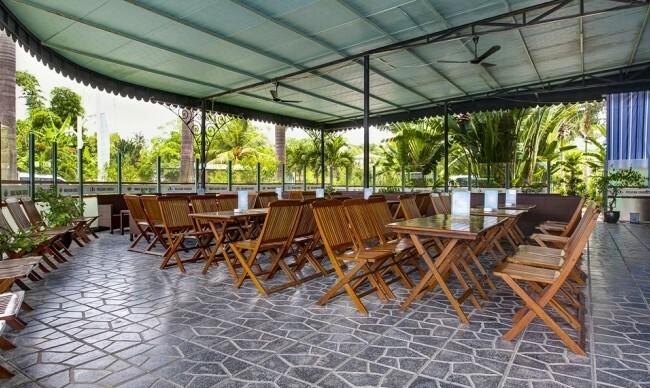 On the top floor stands a spacious sundeck, an excellent place for sunbathing and enjoying unimpeded vista. 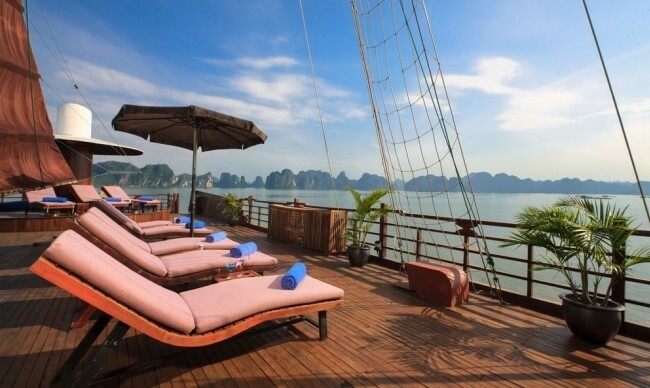 Here is also a perfect space for morning Tai Chi. 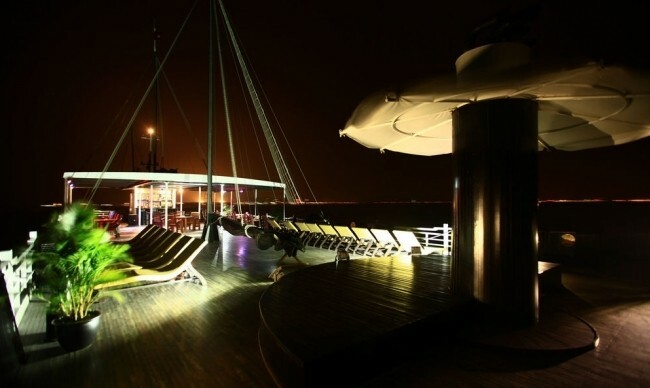 The cool pure air of the bay is invaluable and hard to be found elsewhere in this industrial era. 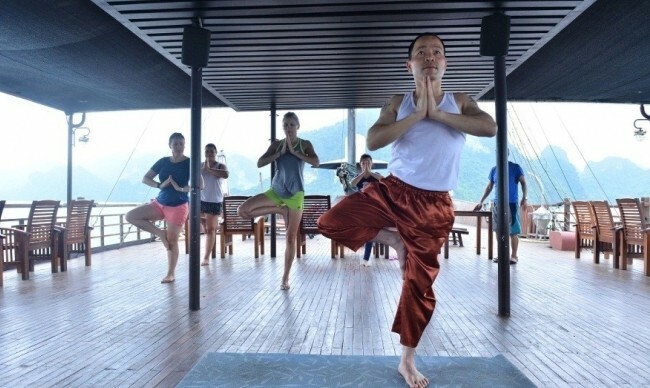 Let’s make the most of it and greet a new day with the utmost relaxation by gentle Tai Chi in Halong style. 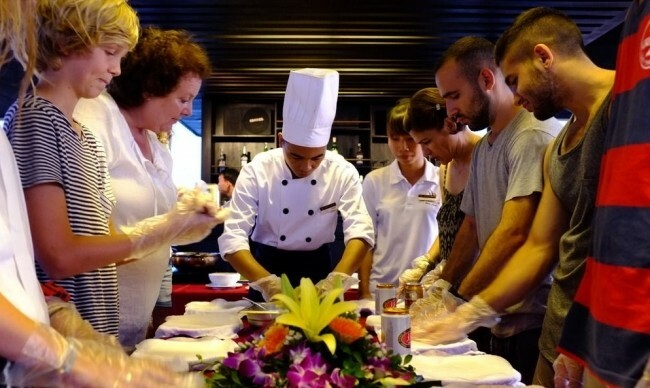 Cooking class is available to satisfy your desire of learning how to cook. 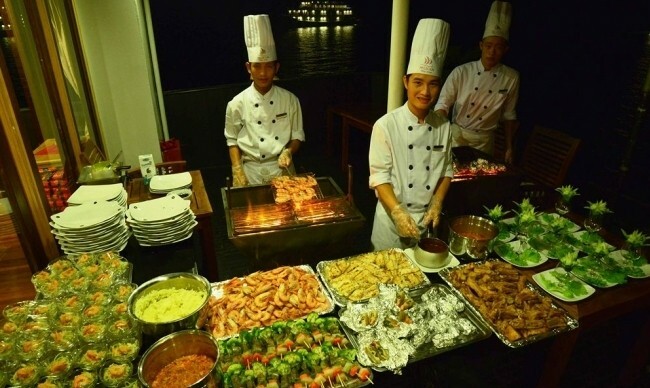 Our chef will do a cooking lesson on fresh spring rolls for example, you and your kids would love it, especially if you are a food lover. 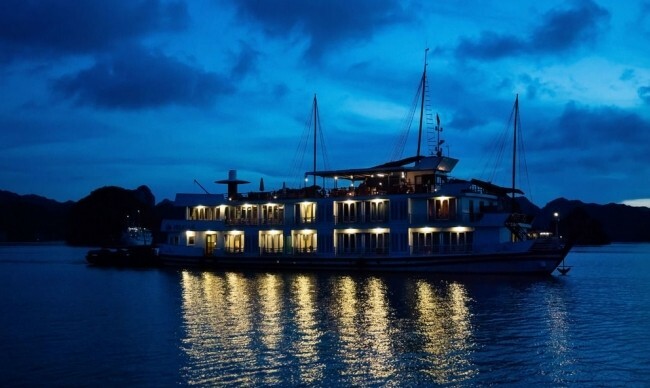 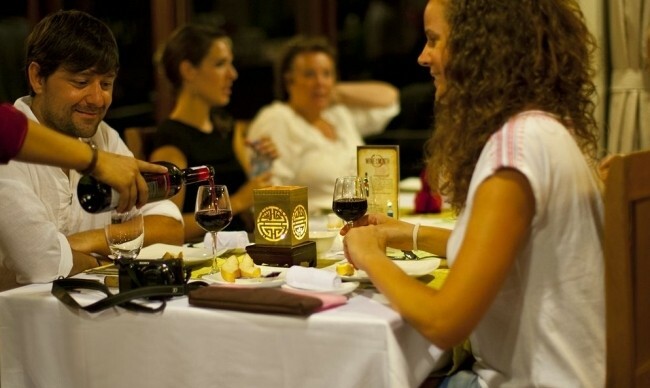 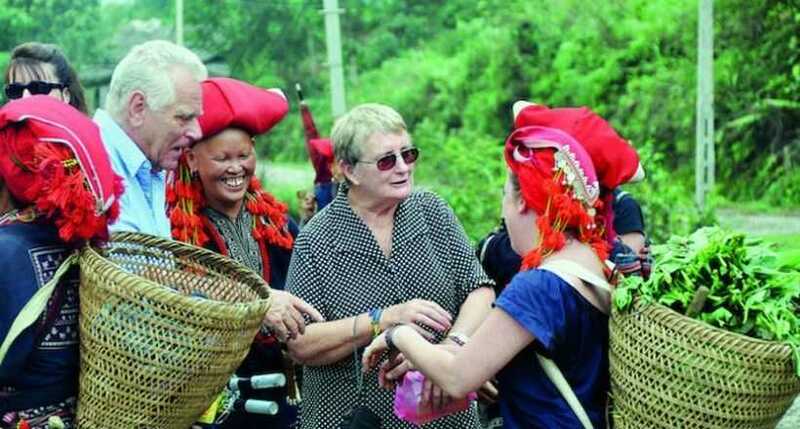 A movie night is organized for tourists to relax and spend romantic time together. 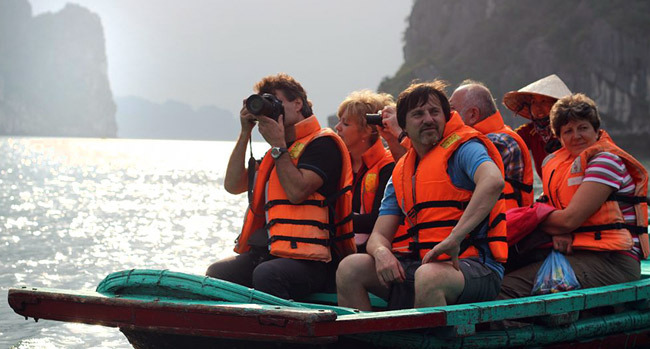 Kayaking gives you a free and wild feeling while rowing amid the Natural Wonder. 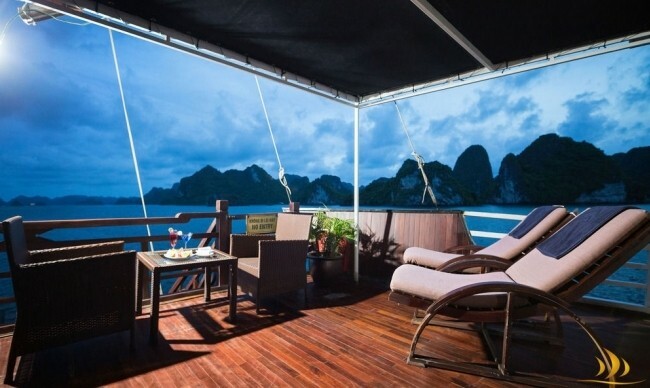 Plentiful islands are mint condition to form calm water, fine current and slight wind. 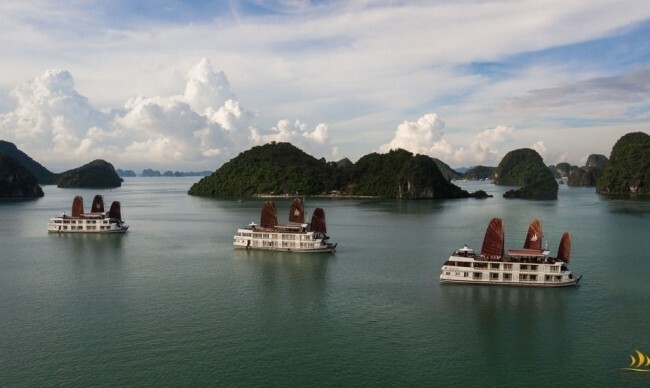 The small and flexible kayak will lead you through islets to visit hidden caves, lagoons, unspoiled beaches and meet smiling local fishermen.